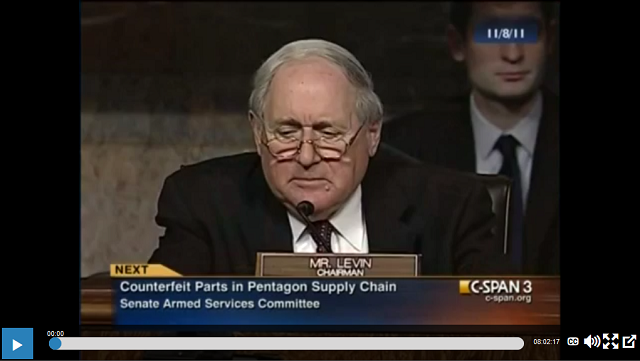 In early 2011 US Senators Levin and McCain announced a Senate Armed Service Committee investigation into counterfeit electronic parts and the risks these parts pose to the Department of Defense supply chain. On November 8, 2011, the Committee held its first hearing in Washington, DC during which Senator Levin promised a swift response. Testimony during this hearing revealed the results from a congressional probe which found at least 1,800 cases of counterfeit electronics in US weapons systems covering more than 1 million suspect parts. Approximately 70 percent were traced to Chinese firms. Panel members also testified that counterfeiting costs the semiconductor industry an estimated $7.5 billion a year in lost revenue and about 11,000 US jobs alone. On November 29, 2011, the US Senate unanimously approved an amendment to the National Defense Authorization Act for Fiscal Year 2012. President Obama signed the Defense Bill (H.R. 1540) into law on December 31, 2011. Each year since, amendments have been made relating to the detection and avoidance of counterfeit electronic parts as rule makers respond to this evolving threat. The Senate’s “Inquiry into Counterfeit Electronic Parts in the Defense Supply Chain” lifted the veil on counterfeit electronics across the globe. The threat of counterfeit electronic parts continues to plague the world’s military, aerospace, defense and high tech electronics manufacturing communities. 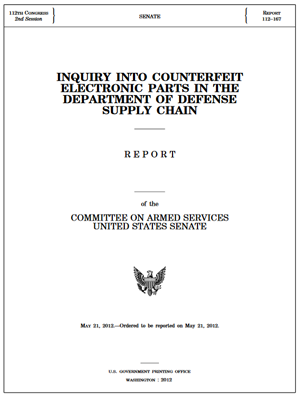 In March of 2011, the Senate Armed Services Committee initiated an investigation into counterfeit electronic parts in the Department of Defense (DOD) supply chain. The investigation uncovered overwhelming evidence of large numbers of counterfeit parts marking their way into critical defense systems. It revealed failures by defense contractors and DOD to report systems. The investigation exposed a defense supply chain that relies on hundreds of unvetted independent distributors to supply electronic parts for some of our most sensitive defense systems. And it found overwhelming evidence that companies in China are the primary source of counterfeit electronic parts in the defense supply chain. Section I provides background on counterfeiting and discusses factors that make defense systems particularly vulnerable to counterfeit electronic parts. Section II describes the Committee’s findings on the extent of counterfeiting in the defense supply chain and discusses the types of parts and countries of origin of counterfeit parts identified by the Committee. Section III describes an investigation, conducted by GAO at the Committee’s request, into online sales of counterfeit parts. Section IV consists of several case studies of counterfeit electronic parts that were identified by the Committee as having been integrated into defense systems. Section V discusses suspect parts identified by the Defense Logistics Agency (DLA) and describes agency policies and practices relating to counterfeit parts. Section VI describes provisions contained in the FY 2012 National Defense Authorization Act aimed at reducing the number of counterfeit electronic parts in the defense supply chain. Witnesses testified during a Senate Armed Services hearing about sources of counterfeit electronic parts, how they are made, cases where counterfeit electronic parts have penetrated the defense supply chain, and the cost and potential impact of counterfeit electronic parts on defense systems. (Sec. 815) Revises requirements for the detection and avoidance of counterfeit electronic parts to require contractors and DOD to meet certain requirements using "suppliers that meet anticounterfeiting requirements" rather than "trusted suppliers." (Sec. 238) Requires DOD to conduct a hardware assurance study to assess the presence, scope, and effect on DOD operations of counterfeit electronic parts that have passed through the Department supply chain and into fielded systems. (Sec. 885) Expands the eligibility for contractors to include costs for rework and corrective action related to counterfeit electronic parts as allowable costs under DOD contracts. Permits DOD to approve industry-selected trusted suppliers. (Sec. 817) Revises sourcing requirements related to avoiding counterfeit electronic parts. (Sec. 803) Directs the Secretary to implement a process for the expedited identification and replacement of obsolete electronic parts included in DOD acquisition programs. (Sec. 818) Directs the Secretary to assess DOD acquisition policies and systems for the detection and avoidance of counterfeit electronic parts. Outlines specific actions to be taken by the Secretary following such assessment, including revising the DOD Supplement to FAR to address such detection and avoidance. Provides contractor responsibilities relating to such detection and avoidance. Requires DOD contractors and subcontractors at all tiers, whenever possible, to obtain electronic parts from trusted suppliers (as compiled by DOD). Requires any DOD contractor or subcontractor who becomes aware of or has reason to suspect that any end item, component, part, or material contained in supplies purchased by DOD is counterfeit to report such fact to appropriate government authorities and the Government-Industry Data Exchange Program. Directs the Secretary of Homeland Security to establish a methodology for the targeting of imported electronic parts as counterfeit sources. Requires the DOD Secretary to implement a program to enhance contractor detection and avoidance of counterfeit electronic parts. Amends the federal criminal code to provide criminal penalties for the intentional trafficking in counterfeit military goods or services. Requires the Attorney General to include in an annual report to Congress on Department of Justice (DOJ) business all DOJ actions taken with respect to such trafficking. Sec. 823 of the bill acknowledged and addresses the risk counterfeit electronic parts pose to astronauts, crew, other personnel and to NASA overall. Sec. 1206 of the bill addresses counterfeit parts.